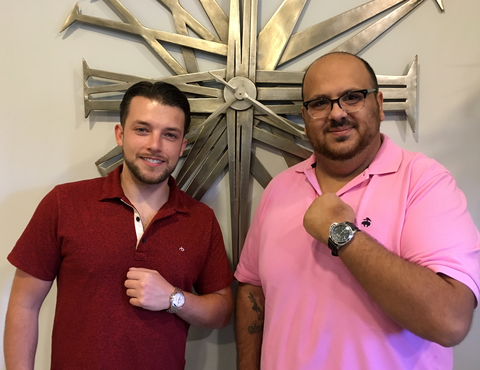 Delray Watch Supply is the brain child of two watch collectors, John Pietrasz (left) and Federico Iossa (right, of Federico Talks Watches). John brings 10 years experience in technology, entrepreneurship, and process improvement. He has worked for brands such as Disney, and companies large and small. He has been buying and selling watches for the greater part of the decade. Federico brings over 10 years of experience in the watch industry working for brands like Piaget, Cartier, Richemont, Wempe, and more. Made popular with the Federico Talks Watches Youtube series, Fed is the in-house seasoned watch professional. If you have a question about watches, or the industry, Federico can surely answer it. Connected with Federico Talks Watches, Delray Watch Supply is your destination for pre-owned watches that you can trust. We believe in connecting with you on a personal level, to make sure you will truly enjoy your new watch. Delray Watch Supply is here to help.